Capsules Kaempferia Parviflora, also known as Black Galingale, another name - Thai ginger. 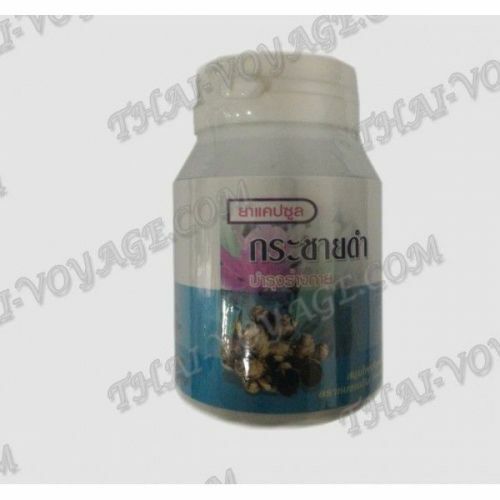 Thai men take Thai ginger to cure impotence, because ginger has a positive effect on the reproductive system. - Relieves the symptoms of hemorrhoids, and diabetes. Registration number: G165 / 49. Usage: 1-3 capsules 2 times a day after meals. In the package of 100 capsules of 450 mg. Composition of the product Black galingale 200 gr; Ginseng 50 gr; Dong Quai 50 gr; Elephantopus scaber L 50 gr.